I don’t know about you guys, but math is one of those subjects that I just really don’t prefer to teach. Give me a good history lesson any day, but math…ugh. While it may not be fun to teach it is necessary, and also quite important! I really want my children to have a good math foundation, but I don’t like them having to do alot of repetitive fluff. Continuing on with our theme of 31 Days of Easy to Use Homeschool Curriculum, I have to tell you about an excellent math program that we use. 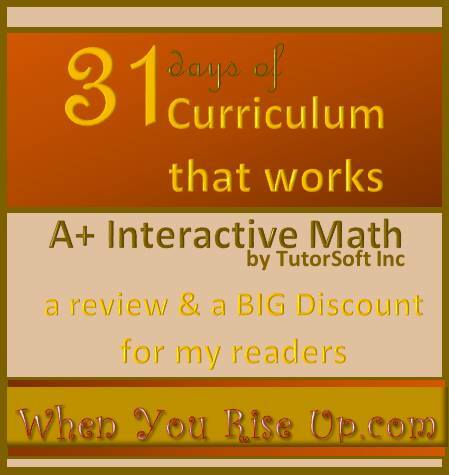 A+ Tutorsoft Math is a wonderful math curriculum that is so super easy to teach. Seriously, the student just logs in and completes the lesson. Even my 1st and 2nd graders are able to complete their lessons with minimal help from me. 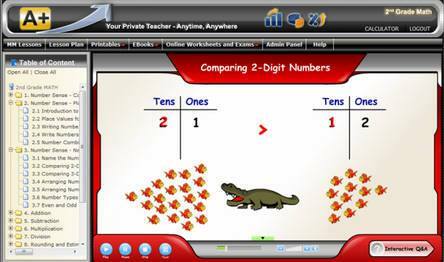 If you’re looking for a math curriculum that is easy to teach, but very meaty then you will definitely want to check out A+ Tutorsoft Math. It is completely computer based. You can use it online or install it onto your computer with a CD. I love the fact that we can choose to print out the practice problems or complete them online. My younger kiddos definitely prefer to do the problems online, but the older boys sometimes prefer to work theirs on paper. Another favorite time saver that I adore about A+ Tutorsoft is the fact that it keeps track of all the grades so all I have to do is print them out. My 1st & second graders get a big kick out of the certificates they can print at the end of the lesson too. It really gives them a sense of accomplishment. 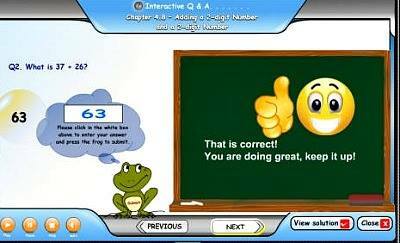 Want to find out more about A+ Tutorsoft Math? Check out their product online here. You’ll be able to sign up for a 30 day free trial if you’d like. I’m so excited to be able to offer a great deal on this wonderful program for you all. Right now A+ Tutorsoft is running a great special where everything is on sale at an awesome price. A+ Tutorsoft is also offering my readers an EXTRA 40% off the sale price of EVERYTHING except for printed books. If you are thinking of using this curriculum you’ll definitely want to grab this deal. 3 month Access is on sale for $25 – Use code RISEUP to get for only $15. Yearly access is on sale for $99 – Use code RISEUP to get it for only $59.40. Really you can’t beat that price for such a great math curriculum! Shop the A+Tutorsoft Sale here.